Blueberry Muffin Tops and Cheesecake Drizzle, a fun and easy recipe from my book, Kid Chef Bakes, a cookbook for kids, and all ages. 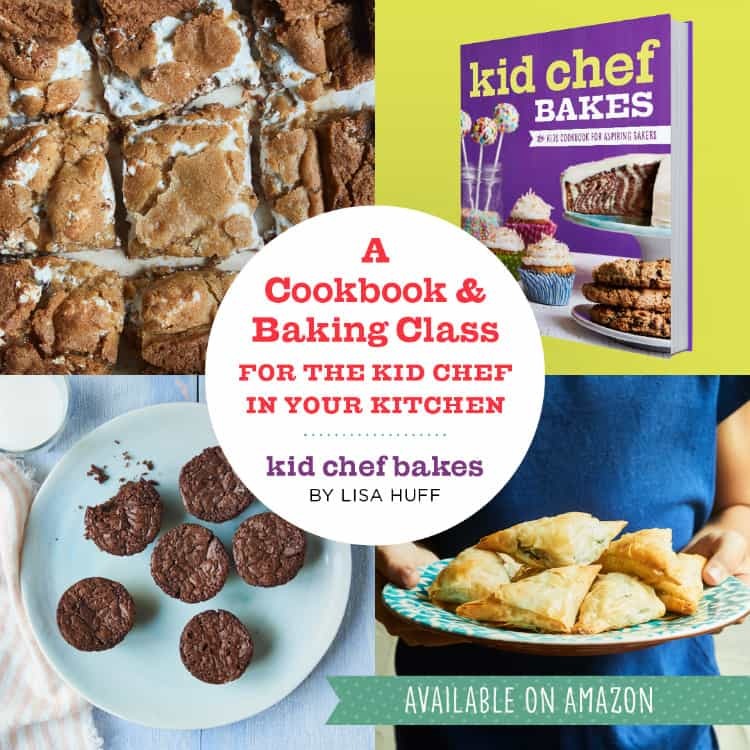 Kid Chef Bakes includes 75+ sweet and savory recipes, baking tutorials, my favorite tools and supplies, and more! Sharing another fun recipe from my book, Kid Chef Bakes, which will be available October 31st! 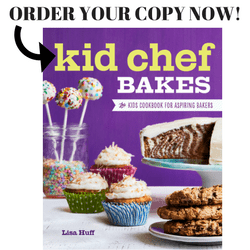 You can check it out on Amazon and PREORDER NOW—> Kid Chef Bakes (<—link to see all the details on Amazon!) 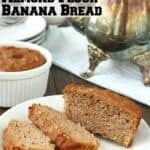 Be sure to check out the other recipes I’ve posted including Lemon Loaf Cake and Soft Pretzel Sticks with Honey Mustard Dip. 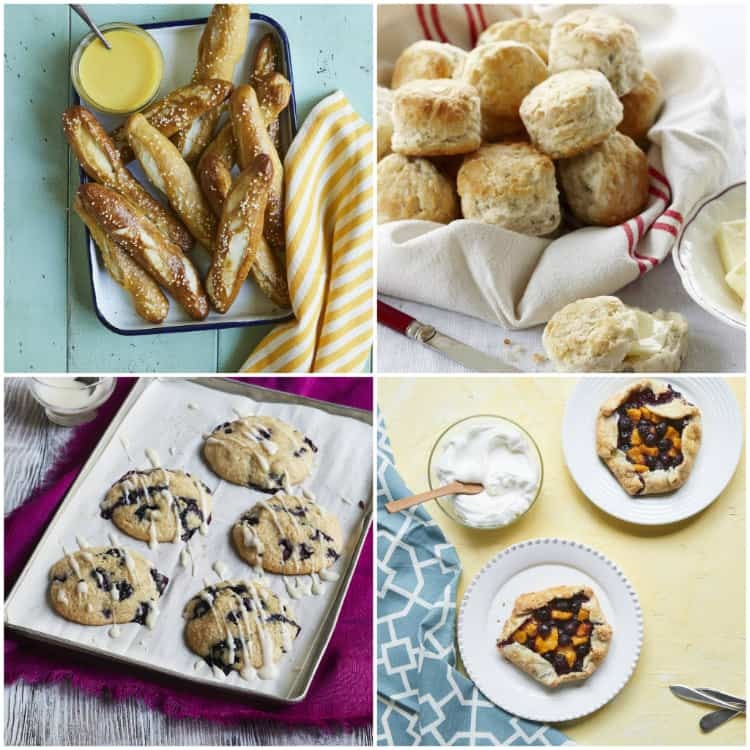 This is just a sample of all the great recipes, in Kid Chef Bakes. 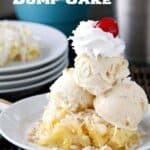 If you like this recipe I’m sure you will LOVE all the other recipes in the book. 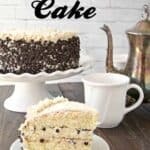 The book includes 75+ recipes including both sweet and savory such as cookies, cakes, pizza, bread, pies, pastries, and more! 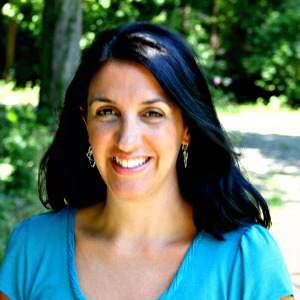 The book is great for kids 8-13ish who are learning and love to bake. However, it’s really great for ALL ages! The book also includes many baking tutorials, some of my favorite baking tools and supplies, and some of my favorite baking tips. 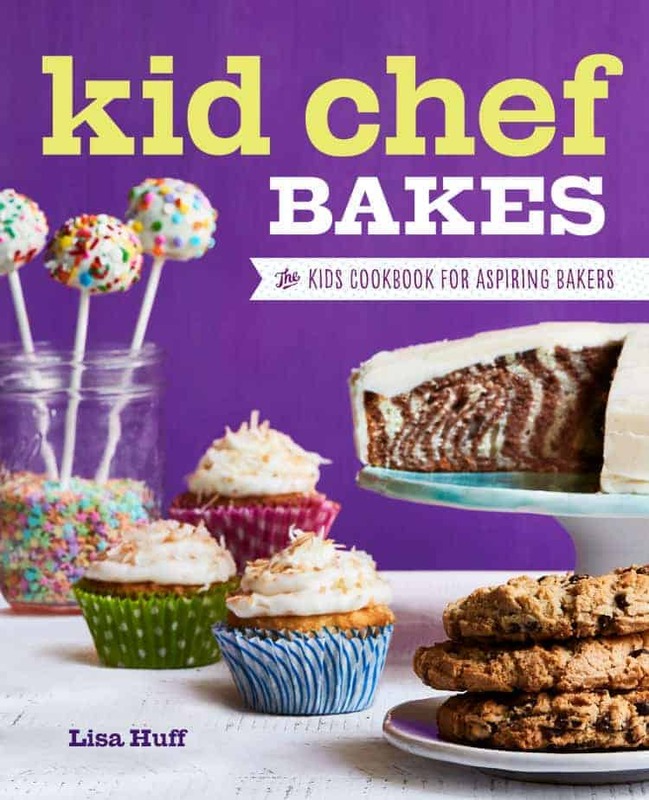 Right now, Kid Chef Bakes is less than $15 on Amazon and if you buy it before October 31st, you get Amazon’s pre-order price guarantee. Bargain! These fun Blueberry Muffin Tops are so easy to make and you don’t even need a special pan. 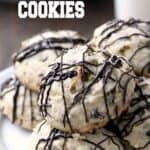 Although you could make them in a muffin top pan if you want to. When testing this recipe for the book, I actually made the muffin tops 3 ways to see how they all turned out. 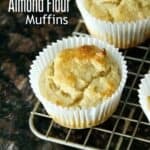 I made them on a parchment paper lined baking sheet, in lightly greased and floured standard muffin pans, and in standard muffin pans with paper liners. All three ways turned out great but a little different. I liked that baking the muffin tops on baking sheets, they had room to spread creating larger muffin tops. However, the lightly greased and floured muffin pans, created great muffin tops that were more golden brown and crisper around the edges. The paper liners are always an easy option, especially for cleanup, but have to admit, it was my least favorite. The sides don’t get as golden brown and they end up just looking like little muffins, but it does work! To make the muffin tops, start by mixing the dry ingredients, flour, sugar, baking powder, and salt together in a medium bowl. Then mix together the “wet” ingredients in a separate bowl including the milk, oil, egg and egg yolk, and vanilla. Make a well in the center of the dry ingredients and add the wet ingredients to the middle and whisk or stir until just combined. Be careful to not overmix the batter for the Blueberry Muffin Tops. Very gently fold in the blueberries to the batter. If you fold too long, the batter may turn a bit blue. If it does, the muffins will still taste good! So this is where you choose what kind of pan you want to use. 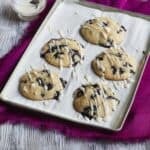 I used a large ice cream scoop and spooned about 3 tablespoons of batter onto parchment paper lined baking sheets leaving about 2 inches between each muffin top. I baked 6 Blueberry Muffin Tops to a pan and baked in batches. Bake the muffins for about 10-14 minutes or until they are golden brown around the edges. If you are using a different pan, you may need to adjust the baking time. Insert a toothpick in the middle of a muffin top, and when the toothpick comes out clean, the muffins are done. Cool the muffins completely, then make the Cheesecake Drizzle by mixing together the cream cheese, powdered sugar, and vanilla. Be sure the cream cheese is softened to room temperature or you may end up with a lumpy drizzle. Then slowly stir in the milk to the bowl a little at a time until everything is mixed together and a the cheesecake drizzle is a thin consistency. Drizzle the mixture over the cooled muffin tops. Let the muffins sit for a few minutes for the drizzle to set a little before serving. 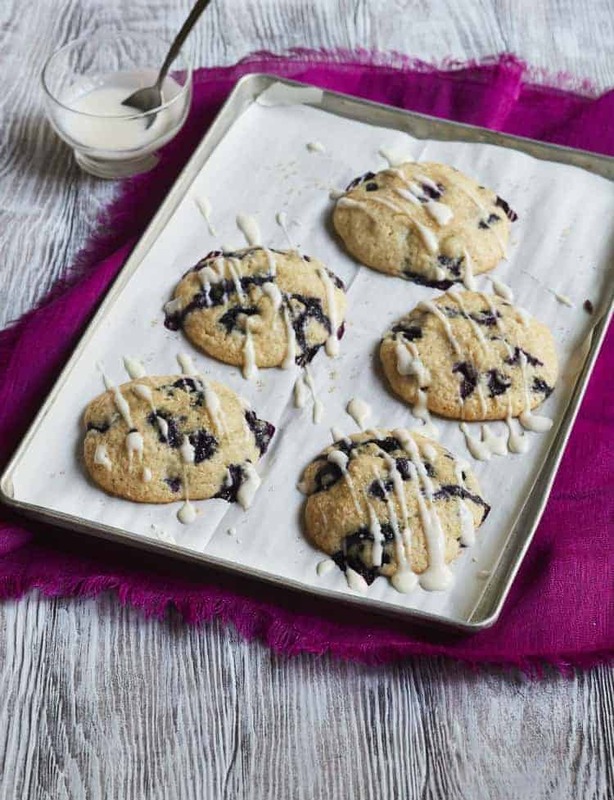 Hope you enjoy this recipe for these fun Blueberry Muffin Tops with Cream Cheese Drizzle! Blueberry Muffin Tops with Cheesecake Drizzle, an easy muffin top recipe with blueberries and a cheesecake topping! Preheat the oven to 375 degrees F. Line 2 large baking sheets with parchment paper, or lightly grease with butter. Mix the dry ingredients. 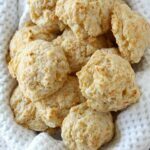 In a medium bowl, stir together the flour, granulated sugar, baking powder, and salt. Mix the wet ingredients. In another medium bowl, whisk together the 1/3 cup of milk, oil, egg, and egg yolk, and 1 teaspoon vanilla until well combined. Combine the ingredients. Make a well in the center of the dry ingredients. Add the wet ingredients to the middle of the dry ingredients, and stir until nearly blended. Some lumps are ok. Gently fold in the blueberries until everything is just combined. Bake the muffins. Using a large ice cream scoop or spoon, spoon about 3 tablespoons of the batter onto the prepared pans for each top, leaving about 2 inches of room between each. Bake for 10 to 14 minutes, or until a toothpick inserted into the middle comes out clean and muffins are slightly browned around edges. Cool slightly, then remove muffins from the pans and cool on a wire rack. Make the drizzle. Meanwhile, in a small bowl, mix together the cream cheese, powdered sugar, and 1/4 teaspoon vanilla. Slowly stir in the milk, a little at a time, until well blended and a thin consistency. With a fork, drizzle over the cooled muffins. SNAPPY TIPS: For a crunchier muffin, sprinkle a little crystal or turbinado sugar on top of the muffin tops before baking. SNAPPY SUBSTITUTIONS: Instead of vanilla, you could add a little orange juice and orange zest. These look super tasty! I bet your kitchen smells wonderful when you make them! wow so many yummy treats! So many fun recipes. And who doesn’t love the top of the muffin! This cookbook looks amazing and so fun! And I love the recipe that is just the best part of the muffin anyway! Why have I never thought to make just the muffin tops! And that drizzle! Oh I can’t wait to give this a try! Mmmmm.